Metal alloys, by virtue of composition, are often grouped into two classes—ferrous and nonferrous. Steels are alloys of iron and carbon plus other alloying elements. In steels, carbon present in atomic form, and occupies interstitial sites of Fe microstructure. Alloying additions are necessary for many reasons including: improving properties, improving corrosion resistance, etc. Arguably steels are well known and most used materials than any other materials. 1) Mechanical properties of steels are very sensitive to carbon content. Hence, it is practical to classify steels based on their carbon content. High carbon steels (% wt of C > 0.6). 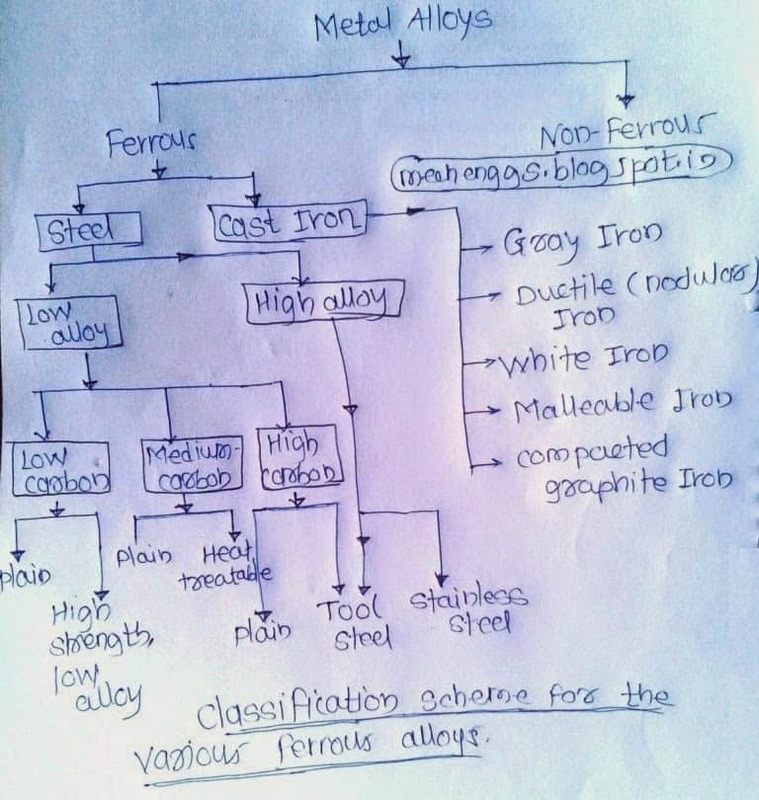 2) The other parameter available for classification of steels is amount of alloying additions, and based on this steels are two kinds: (plain) carbon steels and alloy-steels. These are arguably (probably) produced in the greatest quantities than other alloys. Carbon present in these alloys is limited, and is not enough to strengthen these materials by heat treatment; hence these alloys are strengthened by cold work. Their microstructure consists of ferrite and pearlite, and these alloys are thus relatively soft, ductile combined with high toughness. Hence these materials are easily machinable and weldable. Typical applications of these alloys include: structural shapes, tin cans, automobile body components, buildings, etc. A special group of ferrous alloys with noticeable amount of alloying additions are known as HSLA (high-strength low-alloy) steels. Common alloying elements are: Cu, V, Ni, W, Cr, Mo, etc. These alloys can be strengthened by heat treatment, and yet the same time they are ductile, formable. Typical applications of these HSLA steels include: support columns, bridges, pressure vessels. These are stronger than low carbon steels. However these are of less ductile than low carbon steels. These alloys can be heat treated to improve their strength. Usual heat treatment cycle consists of austenitizing, quenching, and tempering at suitable conditions to acquire required hardness. They are often used in tempered condition. As hardenability of these alloys is low, only thin sections can be heat treated using very high quench rates. Ni, Cr and Mo alloying additions improve their hardenability. Typical applications include: railway tracks & wheels, gears, other machine parts which may require good combination of strength and toughness. These are strongest and hardest of carbon steels, and of course their ductility is very limited. These are heat treatable, and mostly used in hardened and tempered conditions. They possess very high wear resistance, and capable of holding sharp edges. Thus these are used for tool application such as knives, razors, hacksaw blades, etc. With addition of alloying element like Cr, V, Mo, W which forms hard carbides by reacting with carbon present, wear resistance of high carbon steels can be improved considerably. The name comes from their high resistance to corrosion i.e. they are rustless (stainless).Steels are made highly corrosion resistant by addition of special alloying elements, especially a minimum of 12% Cr along with Ni and Mo. Stainless steels are mainly three kinds: ferritic & hardenable Cr steels, austenitic and precipitation hardenable (martensitic, semi-austenitic) steels. This classification is based on prominent constituent of the microstructure. Typical applications include cutlery, razor blades, surgical knives, etc. Ferritic stainless steels are principally Fe-Cr-C alloys with 12-14% Cr. They also contain small additions of Mo, V, Nb, and Ni. Austenitic stainless steels usually contain 18% Cr and 8% Ni in addition to other minor alloying elements. Ni stabilizes the austenitic phase assisted by C and N. Other alloying additions include Ti, Nb, Mo (prevent weld decay), Mn and Cu (helps in stabilizing austenite). By alloying additions, for martensitic steels Ms is made to be above the room temperature. These alloys are heat treatable. Major alloying elements are: Cr, Mn and Mo. Ferritic and austenitic steels are hardened and strengthened by cold work because they are not heat treatable. On the other hand martensitic steels are heat treatable. Austenitic steels are most corrosion resistant, and they are produced in large quantities. Austenitic steels are non-magnetic as against ferritic and martensitic steels, which are magnetic. are used Widely in casting, forming, and machining operations for both metallic and nonmetallic materials. They generally consist of high-speed steels (molybdenum and tungsten types), hot and cold-Work steels, and shock-resisting steels. Table : Application Of Tool Steel.